It's a story of some good coming out of turmoil; owner Ambrose Lee's father had passed away, then his grandmother, and then a long-term relationship ended. 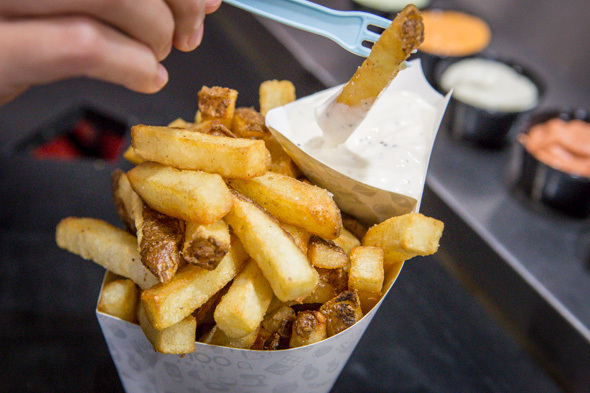 He took some time off to go on a solo backpacking trip through Europe, where he inevitably fell in love with the Belgian friteries he came across in Brussels and Bruges. 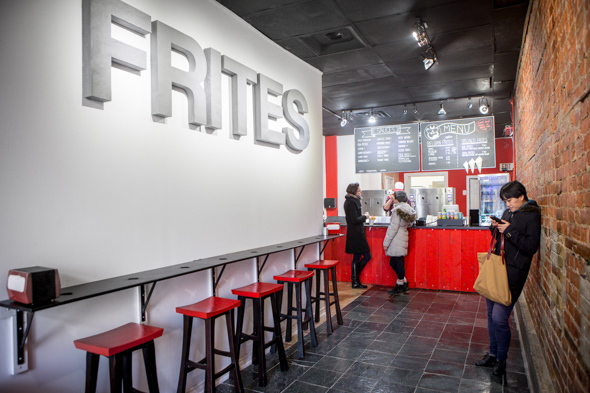 Lee, who previously worked in marketing for a non-profit social housing organization, decided it was time for a change, took the plunge and started up his own frites shop. 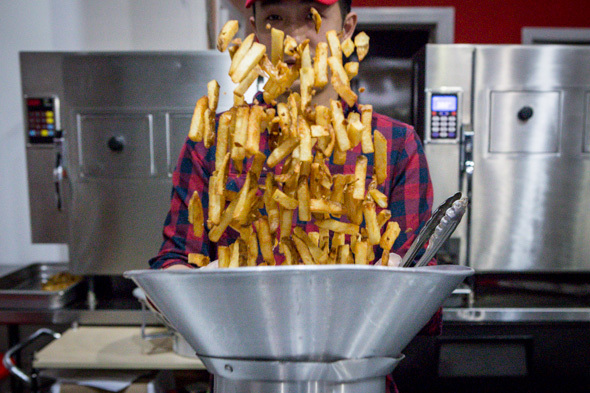 He did intensive and obsessive research on how to make the perfect batch of fries. Since bintje potatoes aren't available here, he uses high-starch russets instead. 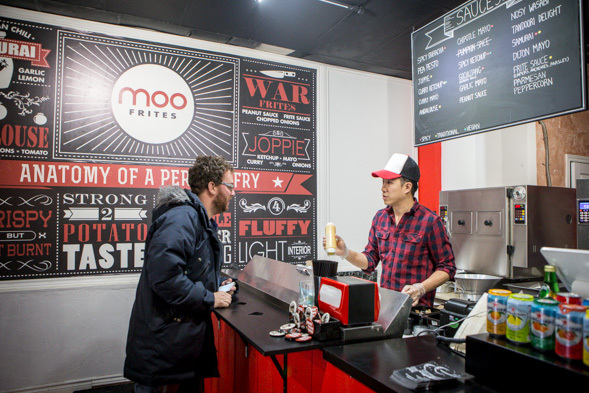 He hand cuts them into thick strips, blanches them, deep-fries and then freezes them overnight before deep-frying them a second time to order in canola oil (or for $1 extra, they can be deep-fried in beef fat, the way it should be done - hence the "Moo" in the name of the shop). They're then tossed with salt and served - golden and crispy on the outside, light and fluffy on the inside, with a strong taste of potato. Each paper cone ($4 for small, $5.95 for regular and $7.95 for large) comes with the customer's choice of one dipping sauce, and this isn't an easy decision to make, with 18 different house-made sauces to choose from. There's andalouse (bell peppers, onions and tomato), curry ketchup, gochujang, nosy wasabi or samurai (Tunisian chili, caraway seeds, garlic and lemon), to name but five. A colour code on the menu indicates which are traditional, spicy or vegan (most are gluten-free as well). Fortunately, Lee will let you sample as many as you want, and if you have trouble deciding, each additional sauce is $1.25, or three for $3. I've tried 17 of the 18 sauces (Lee was reworking the pumpkin spice), and parmesan peppercorn and joppie (ketchup, mayo, curry and onions) are my personal faves. 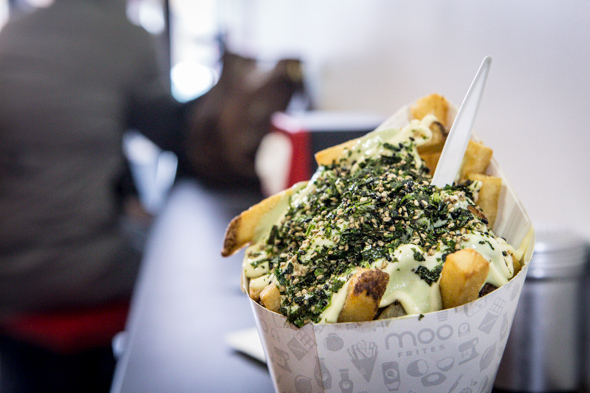 There are also specialty offerings like japo frites ($7.50), which are fries topped with Japanese and Wasabi Mayo, crushed nori and sesame seeds - a heavenly mix if you're into salty, spicy, sinus-clearing flavours. Then there's the war frites (also $7.50), a Dutch classic: peanut and frite sauce (capers, anchovies and parsley) topped with chopped raw onions. Even though I'm not a fan of raw onions, I can't deny the whole thing is tasty. 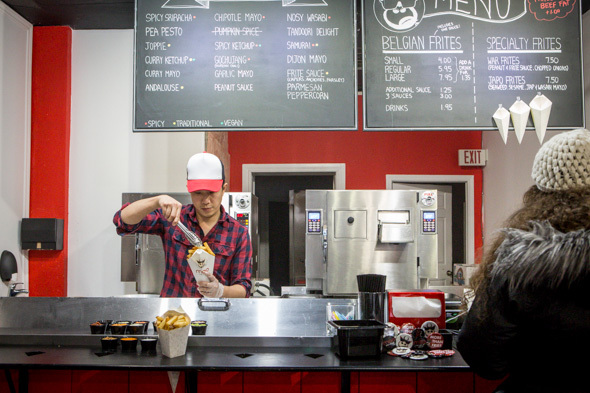 Lee is developing more specialty frites (and will be adding sweet potato fries soon too). The shop itself is a small, narrow barebones space. 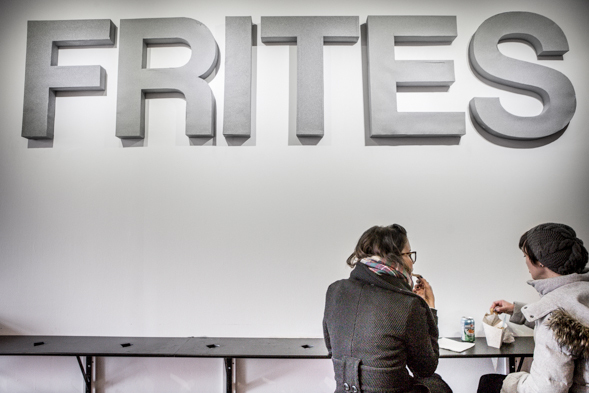 The newly installed high bar tables have diamond-shaped cutouts in them that are designed to hold the paper cones of frites perfectly, and there are enough stools to seat seven or eight people. When I'm there, just about every person who enters has a food-gasm when they try their order; two girls enjoying their frites tell Lee they want to live above the shop so they can eat there every day. 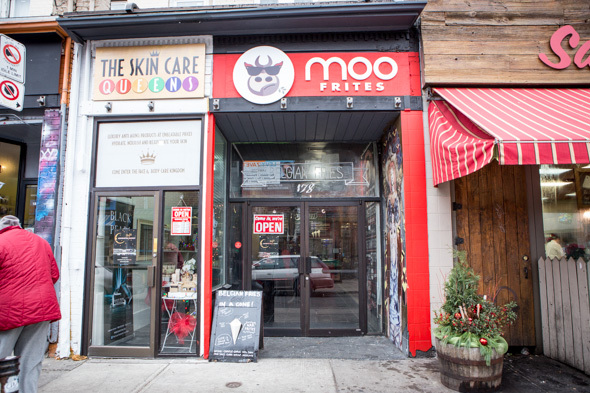 For now, the business is a solo operation, and Lee is living and breathing Moo Frites; he tries every batch of fries he makes to ensure the quality stays consistent. He wants to have the best fries in the city, and I'm happy to report they're definitely a strong contender for the title. Lee was recently left a flattering anonymous note written on a napkin that reads, "These fries are better than Jamie Kennedy ." If that's not a strong endorsement, I don't know what is.